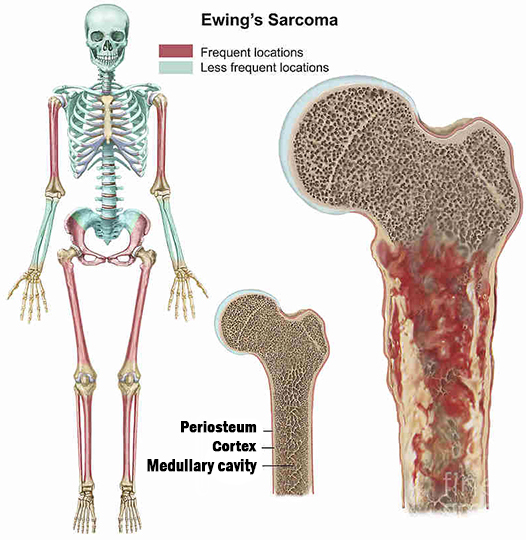 Ewing sarcoma is a type of Cancer that occurs in and around the bones, but most often begins in the leg bones and hipbones as well as in the arms, chest, spine and skull. It occurs rarely in the soft tissues of the legs, arms, abdomen, chest, neck and head. It can occur at any age and is rare but it most commonly develops during puberty when bones are growing rapidly. Boys and young men are affected more frequently than girls and young women. The pelvis is the most common location followed in order by the femur, tibia, humerus and scapula. However, it can be found in any part of the Body. It is 10 times more common in whites than in blacks. These ratios are consistent throughout the world. WHAT ARE THE CAUSES OF EWING SARCOMA? Research suggests that it is not related to exposure radiation or chemicals. It appears that the cell DNA changes after birth, leading to Ewing sarcoma. People with ewing sarcoma complain of pain and sometimes notice as mass. Generally, the mass will continue to grow over the course of a few weeks to weeks. Sometimes, the tumor eats away the bone and causes a fracture. Pain, swelling or stiffness in the area of tumor for weeks or months. If the tumor is near spine, paralysis or loss of bladder control. Under the microscope, Ewing Sarcoma is characterised by small, round and blue cells. Primitive neuroectodermal tumors (PNET) are very molecularly related tumors that often arise outside of the bone and are treated the same as Ewing's sarcoma. Modern treatment includes multidrug chemotherapy as well as local disease control with surgery or radiation. Radiotherapy has been used for localised disease as the tumor has a unique property of being highly sensitive to radiation but the main drawback is that it recurs dramatically after sometime. Surgery is performed is determined by how large the tumor is and how far it extends into surrounding tissues. The goal of surgery is the complete removal of the tumor but surgery is not successful in many cases. Ayurvedic treatment uses the inherent power of natural herbs to treat the disease. The herbs are 100% natural and safe. Ayurveda helps naturally in enhancing the body functioning in the natural way. The herbs for Ewing Sarcoma in Ayurveda help to stop abnormal growth of cells and help in regenerating normal healthy body cells. Even in later stages of cancer, Ayurvedic treatment of cancer help in relieving unearthly pain and suffering. Classical Ayurvedic texts have several references to cancer. Some terms have been used to describe the condition are general while other terms are more specific. Cancer has been described as granthi (benign or minor neoplasm) and arbuda (malignant or major neoplasm). Both can be inflammatory or non-inflammatory based on doshas involved. Tridoshas cause excessive metabolic crisis resulting in proliferation. The modern cancer therapy is known to be burdened by drug-induced toxic side effects. On the other hand, Ayurveda uses multiple herbs possessing great potential for a cancer cure. These herbal formulations work on multiple biochemical pathways and influence different organ systems all together and nourish the body as a whole by supporting body's defence systems. Cancer Care Pack of Planet Ayurveda helps in fighting various types of cancer. It is a combination of different herbs which work in optimal manner to fight cancer at the cellular level. These herbal formulations help in total healing, reduces the side effects and cancer-associated complications. Each herb contains multiple active principles that work synergistically thus produce therapeutic benefits and also lowers the risk of adverse effects thus avoids the need for supplemental therapy. Ashwagandha herb plays a vital role in stress induced disorders including neurological disorders as it possesses a great anti-oxidant and anti-inflammatory properties. It helps to promote the overall well-being of the body and nourishes the brain to make the functioning of the brain quicker and sharper. Planet Ayurveda provides best of Ashwagandha benefits in Ashwagandha capsules. Because of rich medicinal properties, curcumin is widely used herb in case of cancer. Anti-oxidants present in the herb helps in reducing free radicals in the body. In many malignant cancers, curcumin is found to be very helpful. Kachnaar Guggul is a natural product obtained from the mixture of kachnar bark (Bauhinia variegate), Amalki (Emblica officinalis), Haritaki (Terminalia chebula), Bibhaitaki (Terminalia bellerica), Ginger (Zingiber officinale), Black pepper (Piper nigrum), Pippali (Piper longum) and Varuna (Crataeva religiosa). Kachnaar Guggul helps to maintain cells and tissues healthy. Tulsi herb possesses strong anti-oxidant properties and it helps in removing free radicals from the body. This is a natural product obtained from pure tulsi extract (Ocimum sanctum). Guggul Caspules of Planet Ayurveda are obtained from Guggul (Commiphora mukul). These capsules have anti-oxidant property and are useful in many health conditions. These capsules revitalise the cells and therefore rejuvenate them. This tablet contains mixture of different herbs like Shilajit (Asphaltum), Sugar, Vacha (Acorus calamus), Haridra (Curcuma longa), Karpoor (Cinnamomum camphora), Amla (Emblica officinalis) etc. These tablets have calming effect on the entire body. It is one of the most adaptogen and stress busters that cause relaxation. 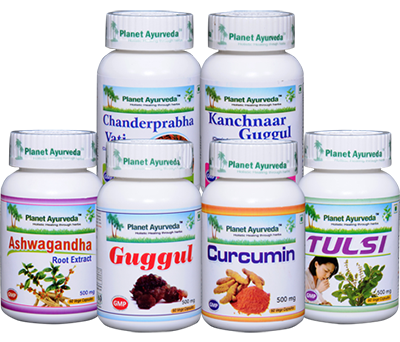 Planet Ayurveda offers a wide range of herbal supplements that are 100% pure, herbal and are prepared through a series of effective and stringent tests to assure their quality. Early detection is believed to be the key factor in combating cancer effectively along with herbal remedies.